When it comes to exercise dosage, physiotherapy has had limited understanding. Historically, physiotherapy has been enamoured with advocating the three sets of ten repetitions (reps) format. Early work on progressive resistance training by army physician, Thomas DeLorme identified that injured US servicemen returning from WWII made significant improvements in function by following this exercise format and so DeLorme’s protocol, understood to be the number of sets and reps required to build strength, became the model of choice in many rehabilitation and fitness centres. It appears that the consensus behind its use was the assumption that people in pain, and/or injured, were weak and concurrently increasing strength would facilitate recovery and attenuate pain (Todd, Shurley, & Todd, 2012). This is not suggesting that exercise does not attenuate pain, there is plenty of research on exercise induced hypoalgesia (Bement & Sluka, 2016; Frey-law & Sluka, 2017; Koltyn, Brellenthin, Cook, Sehgal, & Hillard, 2014; Lima, Abner, & Sluka, 2017; Naugle, Fillingim, & Riley, 2012). There’s often a little more to it, hence the need for a comprehensive subjective history and appropriate case formulation to explore the suitability of exercise and, if possible, dosed appropriately for the person living with persistent pain. All physiotherapists should be familiar with training principles including overload (enhancing physiological function to produce a training response) specificity (specific exercise/activity elicits specific adaptation creating specific training effects or SAID principle) individual differences (all individuals do not respond similarly to a given training stimulus) and reversibility (detraining occurs quickly when a person quits their training program) (Katch, McArdle, & Katch, 2011). Each of these principles are pertinent when formulating an exercise program. Evidence around exercise and pain. It is pertinent to acknowledge the significant challenge that clinicians and people living with pain face when undertaking exercise. Clinicians can be guilty of telling people to stop if there is pain when exercising resulting in a reinforcement of avoidance behaviour (Fordyce, 2015). Moreover, studies have identified that clinicians with a more biomedical tendency may unknowingly be perpetuating the belief that pain equals damage by encouraging patients to stop exercising when they experience pain (Bunzli et al 2015; Simmonds et al 2012; Synnott et al 2015). Humans are inherently social creatures that don’t like to see other’s suffer and physiotherapy is part of the caring professions, so it makes sense that the last thing any physiotherapist would want is to increase a person’s pain. The reaction to exercise is an important topic of discussion. Flare ups are common and normal. As pain is a multi-dimensional phenomena, flare ups can occur for any number of reasons, and so clinicians MUST be completely comfortable with the idea that experiencing pain does not (1) harm people (2) mean they’re in danger (3) harm you. Therefore, it pays to keep a cool head. 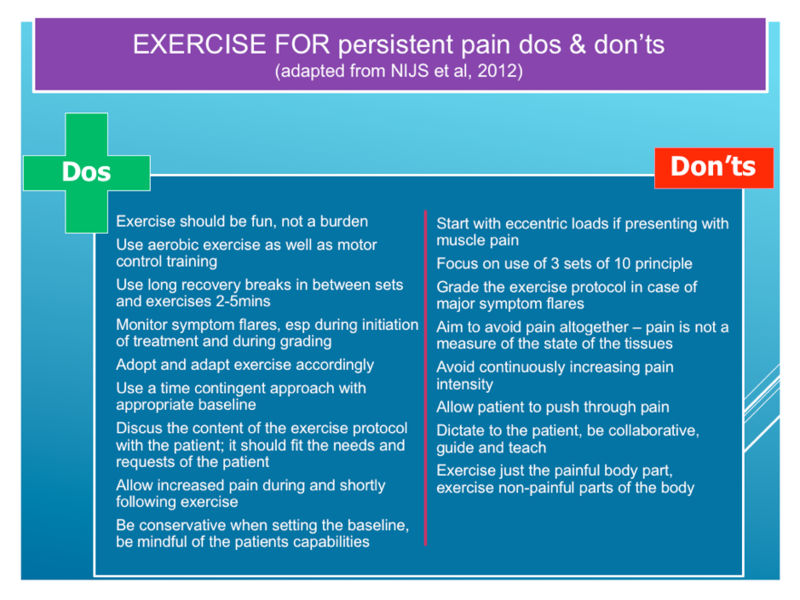 Nijs, Kosek, Van Oosterwijck, & Meeus, (2012) have provided some helpful guidelines (Figure.1) for exercise in individuals with persistent musculoskeletal pain. Whilst exercise may be linked with increased pain (or sensitivity), for individuals with persistent pain it is unlikely to result in exercise-induced harm if dosed appropriately (Booth et al 2017; Geneen et al 2017). Furthermore, utilising case formulation can provide justification for exercise dosage considering individual differences. So, if we are working with someone with increased sensitivity then 1) exercising with some pain may actually be ok and 2) reasoning dosage may provide sufficient progression in activity tolerance. Incidentally, a systematic review and meta-analysis from Smith et al., (2017) found that exercising with pain had benefits in the short-term (but no real benefit from exercise of other treatment in the moderate and long term). Thus, clinicians can feel reassured and reassure patients that it’s ok to exercise with pain. Appraisal of the papers selected by Smith et al identified that participants were encouraged to exercise with the understanding that pain would, 1) not exceed 5/10 on a Visual Analogue Scale (VAS) and 2) that symptoms would subside prior to the next bout of activity or the next day or before the next session. Pain is a subjective emergent phenomenon and a 5/10 for one person during exercise maybe a 2/10 for another or an 8/10 for another doing the same exercise. Therefore, further exploration into potential mechanisms may assist the clinician in determining the higher VAS scores. This is beyond the scope of this blog however in doing so, the clinician could consider the following reflective questions. 1) Why is this person presenting in this way, at this time? 2) How could we reduce distress and disability? 3) What could be done to get the person going again? One popular method of exercise application for pain is pacing or working to quota. The purpose of working to quota is to ensure a pre-set level of activity occurs irrespective of pain intensity, and then gradually increased over time as the body ‘habituates’ to the experience of pain. Historically, working to quota was implemented in combination with an operant learning approach where behaviour is controlled by consequence (Fordyce, 2015). In the case of working to quota, once the quota has been achieved behaviour is rewarded with rest periods. It appears the consensus on the implementation of pacing is that of a linear progression. The metaphor of climbing a staircase is a popular way of describing how individuals should progress with the intention of doing a set time limit on a good day and also on a bad day. 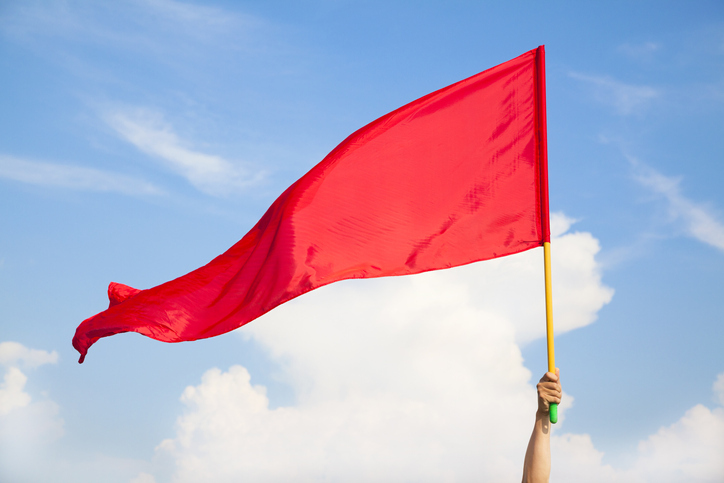 However, this can be problematic particularly if there is a lack of understanding of operant learning principles, resulting in setting individuals up to fail. In addition, people’s lives are not so black and white that such a structured approach could be adhered to, and so the utility of dosage embraces opportunity for variability. Therefore, the remainder of this blog aims to explore an alternative way of achieving an increase in well behaviour. Currently, variability is a hot topic of discussion, it espouses a broad understanding from movement to application of training principles at all levels and in combination with dosage can be used to periodise and modify exercise training (Katch et al., 2011). Although working to quota aims to gradually increase activity on a time contingent basis, dosage, combined with an operant learning approach could provide an additional parameter of volume contingency. Dosage consists of frequency (the number of times you exercise typically in a week), intensity (how hard you exercise, typically measured with RPE) and duration (how long you exercise for recorded by time). Although, strict adherence to the guidelines is not always necessary i.e. Frequency could also mean the number of times you perform the activity in one session as opposed to the number in a week. In some cases, type (the type of exercise you perform – aerobic, weight training) and load (how much you lift) could also be considered. It is reasonable to consider implementing dosage guidelines for people living with pain due to the degree of flexibility available in dosage variables. A simple calculation of dosage variables provides an arbitrary number of work done or total volume. Utilising volume when building activity tolerance reflects a variety of ways the individual could perform an activity, with the intention of continuing to build tolerance. 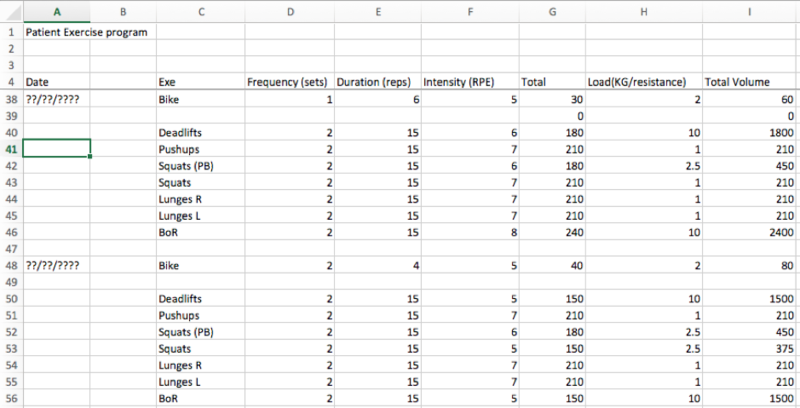 The versatility of volume contingent programs provides a means for patients to see their workloads increase and with the use of subjective scales concurrently identify an increase in their fitness capacity. Volume is indicated as an arbitrary number resulting from a calculation of dosage parameters. A case study follows demonstrating the use of a volume contingent program. A 22 year old female accountant student attended the pain service with a 2 year history of back pain following a hyperextension injury. The individual was a runner, loved hockey and an adventure enthusiast and so the outdoors was incredibly important to her. She had already undergone multiple input from allied health professionals, GP visits and orthopaedic specialists. An MRI scan showed a healthy spine with mild lumbar disc pathology at L4/5 with no nerve involvement and as per specialist recommendation no indicators for surgery. The patient had attempted to get active again and had received manual treatment to facilitate the process. Included in her management was pain education and messages of pain being an output of the brain. The message lead to a misunderstanding of by thinking positively pain will eventually diminish. The patient expressed an understanding of biomechanical reasoning for her pain describing a leg length discrepancy, twisted pelvis and muscle shortening. On assessment, it was evident that the patient presented with avoidance behaviours and negative beliefs about her back expressing a vulnerability and fragility towards movement and her capacity to perform load based tasks. Examination concluded no spinal deformity, no atrophy of spinal musculature. Her movements were slow and guarded, with breath holding and an expression of anxiety towards lumbar movement, which were limited in all directions. Repeated movements demonstrated ambiguity in symptoms due to an increase in distress. She reported a prolonged deep ache in her lower back following the movement assessment. Along with extensive education about tissue healing/pathology, pain, stress, and physiological changes a volume contingent program with a focus on values based activity was developed. The patient wanted to return to her love of running and outbound activities. However, also understood the importance of prioritising simple tasks including, lifting, kneeling, carrying etc. For those that are interested, the patient made a good recovery. She has returned to running and is also exploring outward bound activities. As previously mentioned the historical utility of exercise was the understanding that increasing strength would attenuate pain (Todd, Shurley, & Todd, 2012). Yet, this may create an understanding that lifting weights will be part of the program, resulting in fear and/or anxiety. This is not to suggest that lifting weights should be avoided nor part of the program. Using a volume contingent approach allows the physiotherapist to utilise various exercise principles and dosage parameters to shift the attention from univariate reasoning (i.e continual increase in load) to multivariate reasoning (altering the dosage parameters to increase overall volume). An example might be if the goal is for the individual to cycle a bike so to participate in family cycles. They decide they want to start by exercising 2 sessions a week at 10 minutes on an exercise bike at an intensity of around 4 on a RPE chart. They work at a load of 4 resistance (this is the setting on the bike). The total volume is 320. However, the time limit is too long and the patient is reluctant to attempt a further bout with the same variables. Rather than reducing the time limit the time could be divided into sub-variables i.e. 10 minutes into five two¬¬¬ minute periods the target volume of 320 could be achieved i.e. 2 sessions a week x 5 bouts of 2 minutes at RPE 4 x load 4 = 320. Of course, the load variable could also be reduced to achieve a similar volume. Naturally, the rate of perceived exertion may increase or decrease because of the change in variables. Therefore a further manipulation in variables (i.e increase frequency, duration or intensity) can provide the achievement of the target volume. Furthermore, breaking up the 10 minutes may provide more success in achieving the established quota at the set parameters. The point being that the utility of dosage is highly flexible and can be used for a variety of exercise and activities. Please see the video link for further details. Concurrently, we can identify that the volume is the same despite the reduction in time and the increase in frequency. The individual is given a rest period contingent on the prior agreement of completing the dosage parameters established for the current session, this incorporates an operant learning approach of rewarding well behaviour. The end goal to encourage more adherence to exercise, and (optimistically on my part) less disruption from flare ups. Essentially we are attempting to ‘fly below the radar’. As the individual progresses, the variables can be manipulated (increased or decreased) accordingly with a view to providing feedback around increases in physiological tolerance. A final note on the use of subjective scales as an accompaniment, these include the rate of perceived exertion scale or subjective units of distress scale depending on the model used in therapy. RPE for monitoring increases in physiological demand and SUDS for monitoring the level of distress the individual experiences regarding the task faced. I use both accordingly and often interchangeably. A personal preference and method of challenging threat associated with movement and activity is ‘Facing the Rattle Snake’ (Figure.3). The slide highlights an acknowledgement and expectation that pain will be experienced. It can be used during the sessions and the patient can also take the scale away with them as a guide to monitor their symptoms. By using the analogy of a rattlesnake, people understand that if they get too close to a rattle snake it will give a warning (rattle) and so the sensible thing to do is back off. At the same time the rattle snake (we hope) will back off. It’s a metaphor to represent movement/activity and tissue adaptation to load. The end result, people have more room to move or can be active for longer. The important thing is not to stay in the rattle (progress) zone. 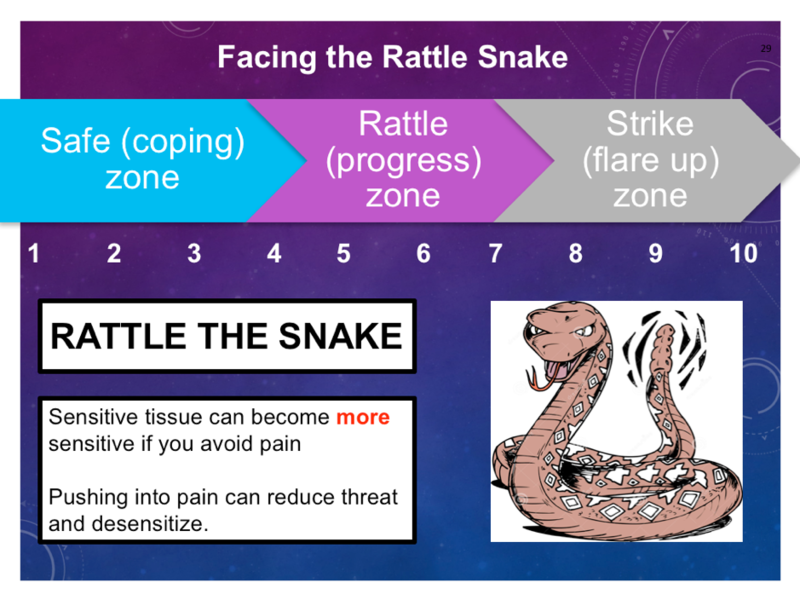 A caveat is the argument that you are letting ‘pain be your guide’ particularly if you are moving in and out of the progress zone hoping for the snake to move away, but it actually never does. If this is the case, it is time to ask those all-important 3 questions mentioned earlier and identify what could be the salient factors. Furthermore, it may be that by staying in the progress zone (knowing that pain won’t harm people) and using techniques such as ACT with graded exposure may facilitate some form of extinction (Craske, Treanor, Conway, Zbozinek, & Vervliet, 2014). It can also be used to monitor what occurs over the next 24 hours and in conjunction with movement/activity and how symptoms trend over time. Clinically, Fordyce identified the importance of working to quota with an emphasis upon time contingency thus increasing physiological tolerance. This article has briefly discussed the history of three sets of ten and strength training as a go to for physiotherapists, the evidence around exercise and pain, discussed the consensus around pacing, a brief case study, an emphasis on the utility dosage has for pain management and finally the use of subjective scales. Of course, a final message is that commitment is what is needed in order to see change. Starting any exercise program or rehab program, if you were to go home and look in the mirror you wouldn’t see change after the first, second, third day week or even month, only with commitment will those physical changes occur. The intention of this article is to spark discussion and deeper thought around the use of dosage parameters in pain management with an emphasis on values based activity and with a view to consider the utility of volume contingency as a multivariate parameter rather than a univariate (time contingent) parameter. Thank you for having a read and with all my blogs I welcome all feedback. Smith, B., Hendrick, P., Smith, T., Bateman, M., Moffat, F., Rathleff, M., … Logan, P. (2017). Should exercises be painful in the management of chronic musculoskeletal pain? A systematic review and meta-analysis. 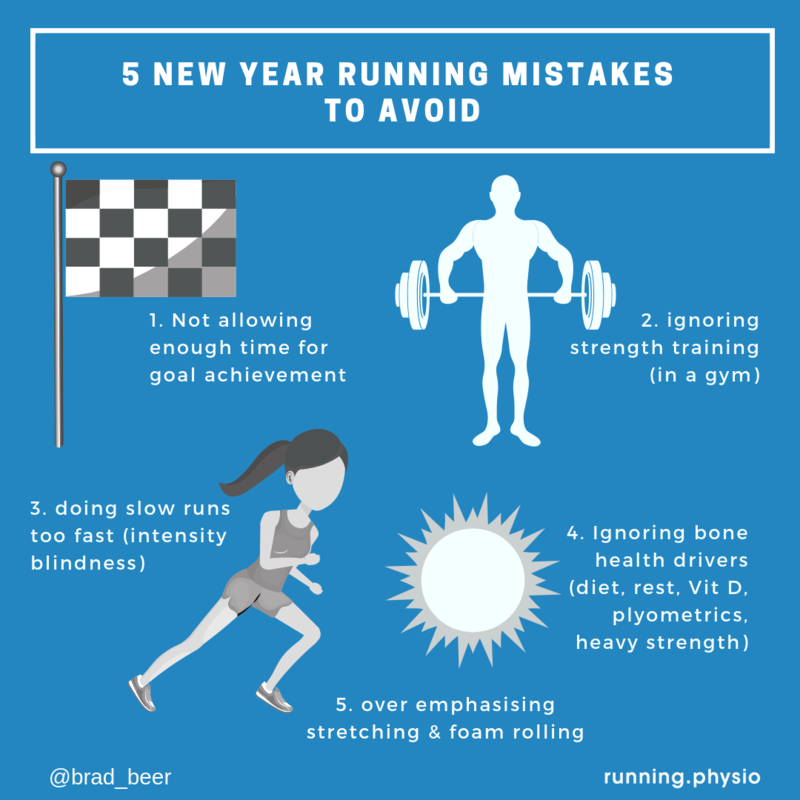 British Journal of Sports Medicine .